Take Florida Turnpike south to Route 1 south. Follow Route 1 south to Stock Island (The island just before Key West) Take a left at the flashing yellow light(3rd Street) and continue to the stop sign. Turn left onto Route 941(Macdonald Ave). Turn RIGHT onto 4TH AVE. Take your first LEFT onto FRONT ST. Follow Front street to the second entrance to Safe Harbor Marina. 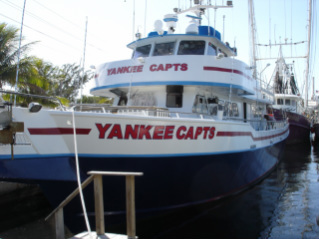 As soon as you turn right into the marina you will see the Yankee Capts We are are located just south of the Hogfish Bar and Grill. Try MapQuest for directions from your place of departure.